I just got back from a very memorable trip to Japan. I have been to Japan many times now, but this time was special. Going with Izawa sensei and five other Aikido students we went to Japan to practice Aikido, to travel to Hokaido and see where Osensei forged his way through the harsh conditions in that area. I will be posting a few different posts on this trip and some of the great things we saw and discovered during the trip. 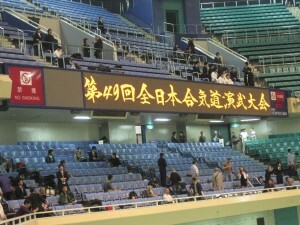 This first post I wanted to start with our attendance of the 49th World Aikido Demonstrations. This was held at the Nippon Budokan in the center of tokyo on Saturday May 28th, 2011. We arrived a little early to get good seats and get settled in. Izawa sensei and one of our group (Kent) went down to the floor for their seats, and Kent was there to help take some photos. We had great seats right behind the North side of the budokan. 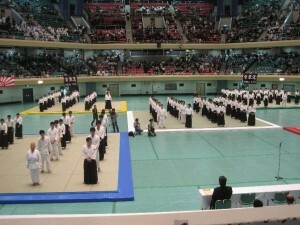 There were five different groups of mats set up in certain positions on the floor. We then had a program guide that stated which groups and/or Aikidoist would be doing a demonstration. It wsa very well organized and lasted about 6+ hours from beginning to the end. There were many different Aikido types and temperments and all were very interesting to see all the variations. The day ended when Doshu, Moriteru Ueshiba (植芝 守央) did his demo. What a great day. We met a lot of people and saw a ton of Aikido. A lot to digest and appreciated the opportunity to watch. The next few days we went to the morning classes at Aikikai Hombu Dojo. The classes were all taught by Doshu himself. 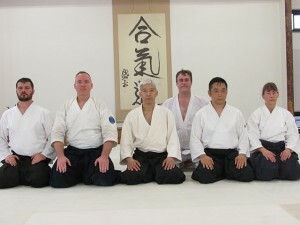 I really like how all the techniques has a common thread and we switched between a lot of different positions (Suwariwasza [both kneeling], Hanmihandachi [one standing one on the ground], and Tachiwaza [both standing]). I felt super lucky be able to take ukemi from Doshu during the class (from Shomenuchi Iriminage). Doshu was kind enough to take a picture with our group after class. A few days later we headed off to the Monbetsu (紋別市) airport in Hokkaidou (北海道). We were picked up by Ozaki sensei. 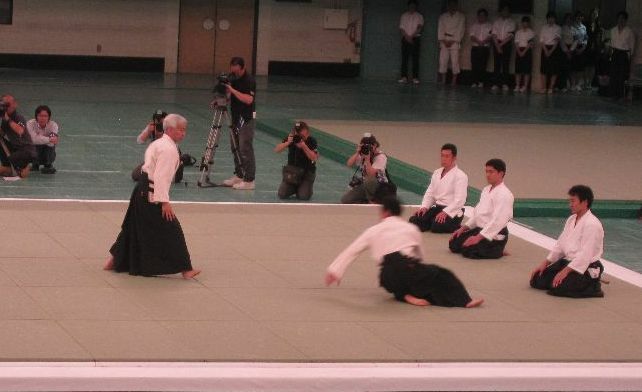 Ozaki sensei was the announcer at the World Aikido Demos a few days before. He has a great personality and really fun to experience our first trip to Hokkaidou. We went right to the his dojo in Yuubetsu (湧別町). We had a great class with his students and after class we all ate dinner together. I will do another post about our really extrodanary experiences here and seeing the historical sites that were associated to Osensei. The last night of our time in Yubetsu we practiced again. 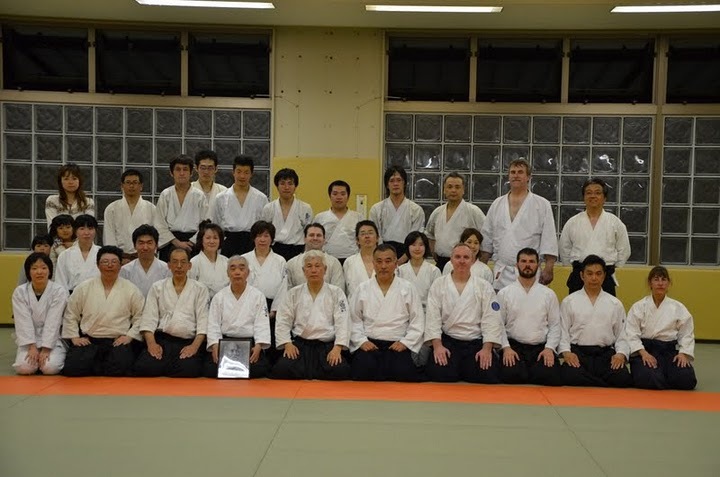 This time Izawa sensei was invited to teach a class and do a demo at the Yubetsu budokan. 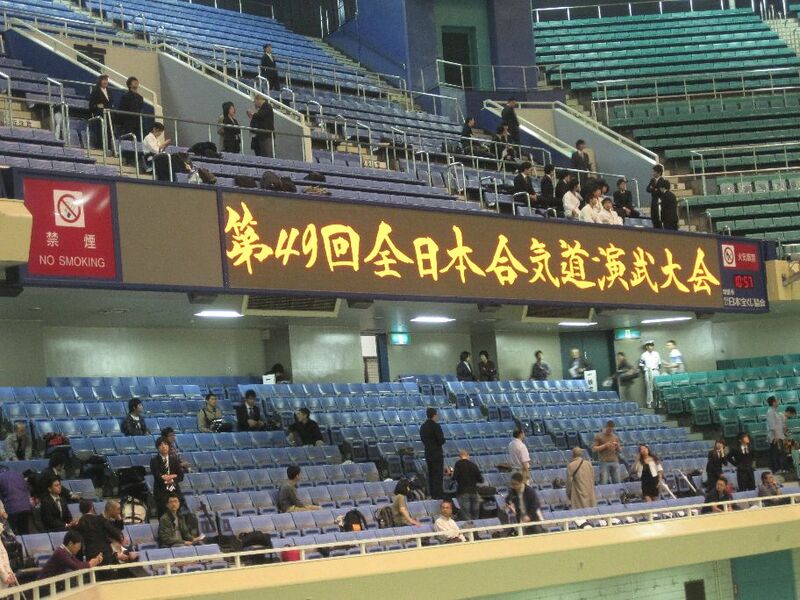 There were a lot of local people along with Ozaki senseis students watching and practicing. Another great time on the mat in Japan. We also had a lot of kids in this class and was fun to see them experience Aikido. The next morning we took a bus to Sapporo Houkaidou. 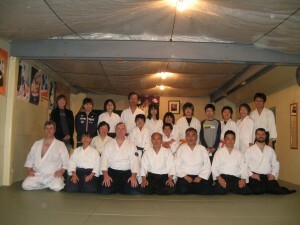 Once we checked into the hotel we met Fujii (藤井) sensei and went to one of the gym dojos (taikukan). This was a big facility and we had about 30 – 40 people practicing. It was right over a pool so had some good humidity :). Fujii sensei taught the first class that night. He has very strong basics and was fun to watch, and even take some breakfall ukemi from him (shihonage). 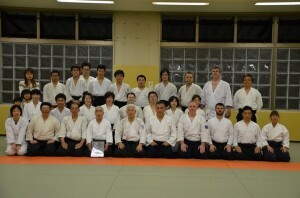 Izawa sensei taught the second class and we all had a great time doing this big Aikido. After class we went to dinner with Fujii sensei and learned more about Aikido in the area. Would be great to go back. This was the end of practice for me on the trip. The rest of the group got to stay a little longer and train this week. I got home a few days ago and hope everyone is having good practice. I will be posting more posts about the trip from different perspectives. Thanks so much for sharing thoughts on this great trip. Even though the phrase “once in a lifetime” is often overused, with this trip I think it applied. Our group had very nice camaraderie and being able to see some of Japan through Izawa Sensei’s eyes and relationships made it all the more special. Starting the trip with the 49th Aikido Demo set the tone for the trip for me. 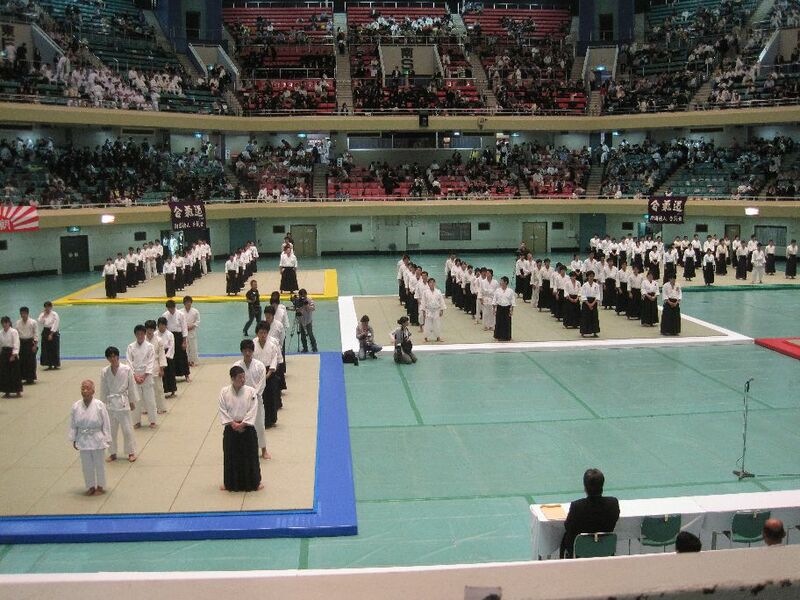 Seeing soooo many Aikidoists, and the crowds in the stand — all there for Aikido for hours!! — was inspiring. And then practicing the next couple days at Hombu with Doshu teaching classes, wow. For me one of the coolest things was that the language barrier didn’t exist on the mat. We all speak “Aikido.” The partners I practiced with at Hombu, at Ozaki Sensei’s dojo, the Yubetsu budokan, and at Fujii-san’s dojo, and again at Hombu were helpful and eager to share their Aikido. Another great memory is exchanging U.S. and Russian coins at dinner the second night with Aikidoka from Russia. I look forward to more of your thoughts and photos!